Wide range except droughty. Tolerates wet soil. Easy. Pest free and very hardy. Fall division is an easy means of increase and will maintain vigor. This delightful iris can be found in the wild across much of northeastern United States. It typically grows in moist swales and other damp locations, though I have found that it is quite tolerant of drier conditions. 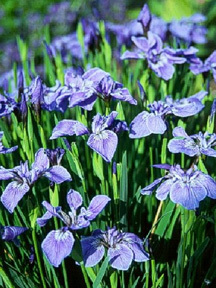 It is a beardless, blue iris that reaches 2 to 3 feet. The leaves are slender and sword shaped. Blooms appear in late spring to early summer. Like most irises, the bloom period is not exceptionally long but the foliage remains attractive all summer.